Official matches and rumbles posting blank? Check here. I've been noticing for some time that more than a few users, both new and old, have went to create an official match or a rumble, only to end up posting said match or rumble blank. I'm creating this topic to, hopefully, to give an explanation for why this is happening. I'm sure sirmethos doesn't mind me "borrowing" his screencap here. No doubt some of you may not have been quite ready to post a full scenario, and have seen this option, thinking what you've typed or copy/pasted so far would be saved for three hours or when you could get back to it, whichever came first. In fact, it was a pretty popular option for many matchmakers here for years. Since electricferret's most recent updates some months ago, however, this is no longer the case. From what I've gathered from users that have tried it, it seems that when one chooses "Save Match", the match goes live immediately, and whatever one had typed up or copy/pasted ended up deleted, instead leaving the "USERNAME Enter your Set-Up for the match here. This is your post - it belongs to you - and you may use the EDIT function at any time in the future to update this post" message in its place. I'm sure more than a few people have used the "Save Match" option, thinking that whatever scenario they had started would be saved, only to instead find that the match had already posted blank, and the scenario was gone. Many of them have even received low grades from the CBUB Match Judges for posting no set-up. This is obviously a bug in the system, and it affects the CBUB matches, control panel-created CBUB Rumbles, and likely FPL matches as well. Will this bug be fixed in the future, or will the "Save Match" function be removed altogether? Who knows? But in the meantime, there's a simple solution for this problem. If you feel you cannot type out a scenario for a match or rumble in a reasonable amount of time, DON'T go for the control panel right away. Instead, type it out on a text editor (Notepad, Wordpad, TextPad, Microsoft Word, etc.) first, save it if necessary, have it ready to copy/paste, and then go to create your match/rumble. Hopefully, this will prevent set-ups from getting erased, and prevent bad grades from coming your way as well. I'm not sure there is any bug in here. Pressing Save Match does not immediately send the match Live. It just puts the characters selected into a saved status for three hours. This feature basically just allows one to reserve some characters and think about the scenario which one will post on the forum. Anyways, I couldn't find anything to fix. Seems to work. Huh, that's weird. I've seen a few cases of people stating that their saved scenarios were erased. I'll check right quick to see if I see some examples. Alright, these may be some examples of what's going on. Whether or not it's a problem on their respective ends I can't really say. Also, for those who were wondering I thought I saved this for later but it ended up posted early. Ah well. Enjoy. Yes I do know "the deal". I was just in the middle of typing my set-up when my mom called me so I had to get off the computer ( I guess it posted accidentally), but it wasn't supposed to be posted yet because I never submitted it. I see, but the thing is in the Match Builder there is no place anywhere anymore where one types any initial scenario text. 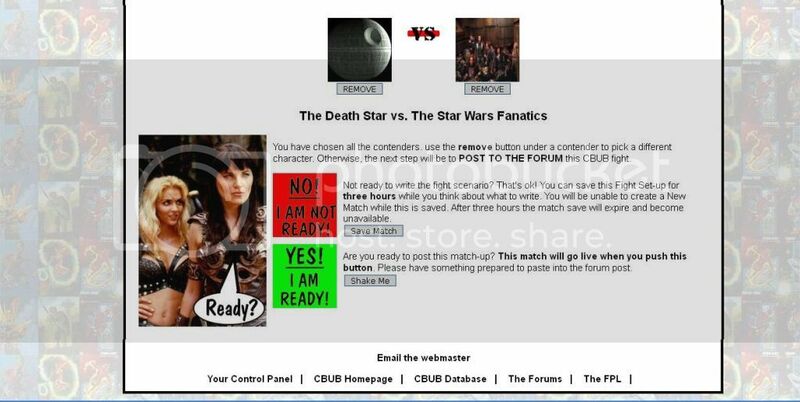 If you press the Start Match button your match will go live and you will be directed to the forum to post your stuff. So, Save Match doesn't save any text... there is no place to enter any. It just reserves your characters.